Keto diet for lung cancer? Is anyone with lung cancer (stage 3b NSCLC squamous) using the keto diet to assist their bodies to halt/slow down tumor growth? Cheers, Basil. I have heard of the Keto diet, but I have learned from physicians and specialist at Mayo that balance is the best for our bodies. I love the vegetable and fruits and fish that Keto diet include. I understand that these foods may be beneficial for certain cancer. grow and share what gives them the best quality of life. I was first diagnosed in 2010. Inoperable (due to location) stage 3b nsclc squamous. Chemo and radiation and all clear for close to 6 years. Then recurrence of the same type and same location. This year I had more chemo and then another ct scan. The scan showed “suspicion” of a “slight” increase in tumor size. So now I wait for my next ct scan at the end of November so I am trying to halt the progression by using diet. Hence trying the keto diet. The journey continues. I agree with your husband. 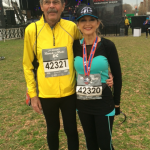 Donna (my wife) and I are living a much healthier life than we were after being diagnosed.